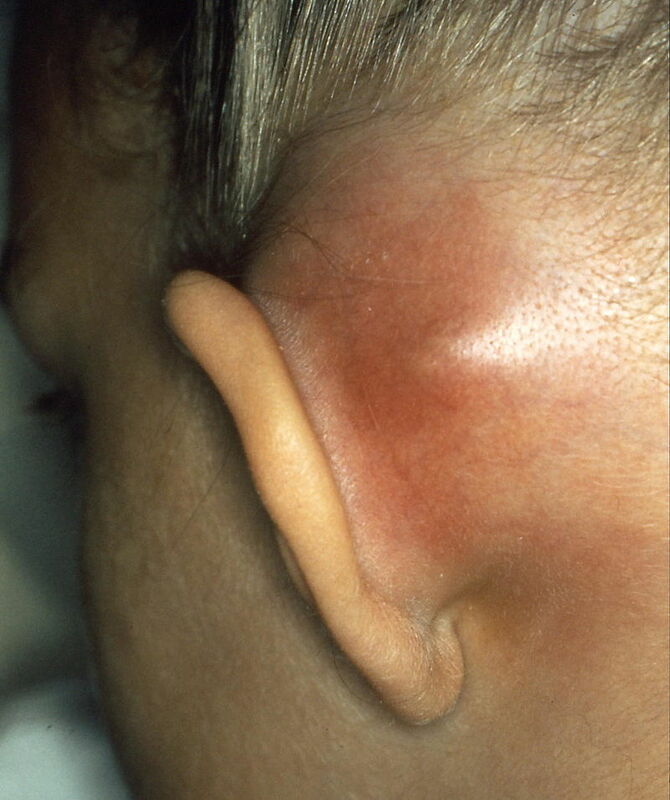 Acute mastoiditis is an intratemporal complication of otitis media. It occurs due to otitis media infection spreading to involve the bone of the mastoid air cells directly. This article will discuss the epidemiology, pathophysiology, clinical features, diagnosis, management and complications of acute mastoiditis. Around 75% of cases of acute mastoiditis occur in children under the age of 2 with a peak incidence at age 6-13 months. Since the introduction of antibiotics, acute and chronic mastoiditis have become quite rare. The incidence in developed countries is 1.2-6.1 cases per 100,000. The mastoid air cells are a collection of air-filled spaces located in the mastoid process of the temporal bone. They communicate with the middle ear via a small canal known as the aditus to mastoid antrum. Infection can spread from the middle ear into the mastoid air cells causing infection of the bone of the mastoid air cells. This in turn leads to breakdown of the fine trabeculae of the mastoid air cells along with collection of pus in the mastoid antrum. As the pus is enclosed under pressure, this causes localised bone necrosis, which can spread to form a sub-periosteal abscess. The diagnosis of acute mastoiditis is based mainly on thorough history-taking and clinical examination. Supporting investigations may be undertaken. Supporting investigations may be undertaken to aid in diagnosis of mastoiditis but should not delay in administration of treatment. CT head and mastoid with contrast is indicated in all cases of mastoiditis apart from cases of simple uncomplicated mastoiditis. CT images will typically show coalescence of the mastoid air cells along with an opaque mastoid and middle ear. It is also helpful in excluding intracranial complications of mastoiditis. MRI head under sedation or anaesthesia is helpful in cases of suspected complicated mastoiditis due to its increased sensitivity in highlighting soft tissue collections or vascular problems. Magnetic resonance venogram (MRV) is best at identifying venous thrombosis, which can be a complication of mastoiditis. The initial management of acute mastoiditis is intravenous antibiotics as an inpatient. The choice of antibiotic will be based on local guidelines but should cover likely causative organisms including Streptococci and Staphylococcus aureus; high-dose co-amoxiclav or ceftriaxone are usually chosen. An oral switch can be considered if the child is recovering and pyrexia has settled. It is recommended that oral antibiotics should be continued for a further 14 days. During the procedure, a myringotomy and drainage of middle ear pus may also be undertaken. Since the introduction of antibiotics, the number of patients with complications associated with mastoiditis has greatly reduced. Complications of mastoiditis can mainly be separated into 2 categories: extracranial and intracranial complications. The prognosis for the majority of cases that are diagnosed early is excellent with a low likelihood of complications occurring. Hussain, S. and Turner, A. (2015). Logan Turner’s Diseases of the ear, nose and throat. 11th ed. CRC Press. Lin, H.W., Shargorodsky, J., & Gopen, Q. Clinical Strategies for the Management of Acute Mastoiditis in the Pediatric Population. Clinical Pediatrics. Vol 49, Issue 2, pp. 110 – 115. What is the peak incidence of mastoiditis? How does the middle ear communicate with the mastoid air cells? What is the initial management of acute mastoiditis? Which of the following organisms commonly cause Mastoiditis? Where is a periosteal abscess least likely to form in mastoiditis?